Danny King leads the Pharr–San Juan–Alamo school district along the U.S.-Mexico border near McAllen, Texas. About 90 percent of the students qualify for free lunch; 99 percent of the students are Latino; and the district’s dropout rate once nearly doubled the Texas average. In recent years, the district has shown remarkable success, including a sharp reduction in its dropout rate, the creation of new pathways for students who often are the first generation in their families to further their education beyond high school, and partnerships with organizations like the Bill & Melinda Gates Foundation. King, a member of the George W. Bush Institute’s Education Reform Advisory Council, has been a major driver of that progress. Slowly and methodically, he has lifted up a district that easily could have been left behind. He did so through insisting upon high standards, measuring student progress, and attracting talented teachers and principals. 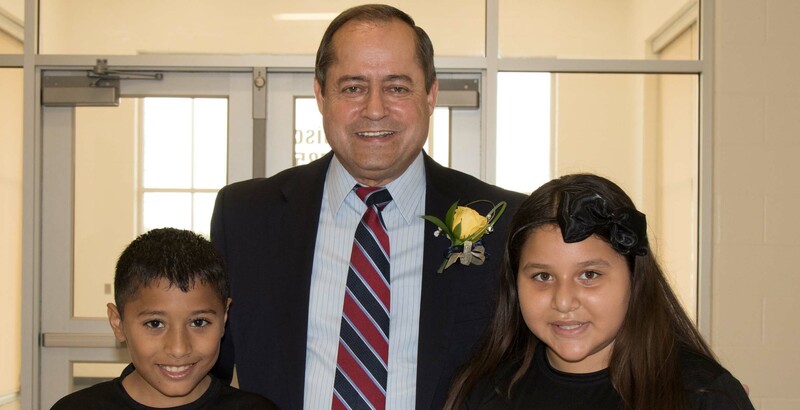 His work has culminated in many awards, including his being honored as Texas Superintendent of the Year in 2013 by the American Association of School Administrators. He emphasizes in this ‘A’ Word interview that his next step is tracking post-secondary completion rates. His vision of accountability’s future includes knowing whether his district’s students are succeeding in college of some kind. If they are simply being remediated, King says, his district is not succeeding. Accountability is taking responsibility for student outcomes. Has that definition changed for you over time, or has it been pretty consistent? The definition has been consistent. What I like to include in it, and what I like to hold myself and our system responsible for, has probably broadened. Looking more beyond 12th grade is one way, making sure that we are improving our students’ completion of post-secondary education. We want to have an impact on that. How have you used accountability principles and practices in your work as a district leader? How does it influence your decisions? Accountability has impact in all areas, from the way we work with curriculum to how we schedule, to how we develop staff. We’ve been doing some performance pay that’s aligned to accountability. That affects staff assignments, as well as hiring or reassigning staff. You mentioned curriculum. How has accountability impacted your work there? We look at the curriculum in areas where we are underperforming. And we might look at other districts that are performing well in areas where we might be struggling. We look at what they are doing, and bring in outside experts to help us. Basically, we dig in and turn everything upside down to get to the bottom of performance issues and any aspects of the curriculum. How has this kind of accountability worked in a district like yours with a large number of students who are English language learners? In general, it’s the same. We try to look at the big picture and not necessarily go for the quick fix. For example, we emphasize bi-literacy and use a dual-language approach, where other districts may look at the quicker path of getting them to English, dropping the Spanish, and just focusing on test prep. We look at more of the long haul. To keep going with the example of bi-literacy, we need resources for training and curriculum. And we have worked with some individuals who looked at students being tested in English and thought, “Why not get them to English immediately and forget about the Spanish?” The research shows that strongly developing the student’s first language will have a better long-term payoff. How do you get people to be willing to do the hard work with you? Does research help? Using research helps; so does being persuasive, tenacious, and persistent. What has limited your ability to use principles of accountability in your policies and work? Is there parental pushback? Resistance from educators? Perhaps a lack of knowledge of what this entails? I don’t think we have faced that in terms of limiting accountability. We have not had any problems implementing accountability metrics in areas that make sense. In other areas, we’ve had to make sure we’re measuring quality and not just quantity. What examples are you talking about when you say “metrics that make sense”? We measured from the beginning when we began to look at reducing the dropout rate. We wanted to make sure we were measuring the increase in the number of graduates. A metric like the dropout rate has different codes. Depending upon the situation, the state may not categorize someone as a dropout or hold schools accountable for them as a dropout. Early on, we wanted to make sure we were monitoring the number of students who were being coded with those kinds of situations. For example, a homeschooler doesn’t count as a dropout. If we were going to increase the emphasis on not dropping out, we quickly decided it was important to measure homeschoolers. If the number of homeschoolers shot up, we wanted to make sure those students were legitimately homeschoolers. Students also could be taken off the dropout list if they returned to Mexico or had a court-ordered requirement for a GED. Whatever the reason, I wanted to make sure we were measuring correctly. I wanted to make sure we were not looking good because of factors we were not measuring. I wanted the improvement to really be due to increased student success. How do you explain to parents, teachers, and the public when you’re rolling out a new form of data, like graduation rates? We explain what we’re ultimately trying to accomplish. I’ve learned to define what we are trying to accomplish and that the result is a positive impact in the student’s life. We’re not looking at numbers; we’re looking at student success and at each student level. Making the best decisions for students is what drives us. Any increase in accountability numbers is based on making good decisions for students and increasing the quality of education for students. It is not based on anything else. What you just explained, that accountability is really in the best interest of the students, has been lost to some extent. Where have we gone wrong in building broad support for accountability? What would help us now to build support? I know the first answer a little better than the second one. A classic error was made in terms of the testing component of accountability, which is an important component. We got caught up with the idea that if a little bit of testing is good, a lot more will be a lot better. We were doing well when we kept it on the three R’s, the fundamentals of education. It went bad in Texas when we moved a few years ago to 15 tests in high school. That’s where the tide really turned. Before that, you had people griping now and then. But we lost it when high school students had to take 15 exams. The majority of the public and educators in Texas, I think, had bought into accountability. Then, parents and others started saying, “Whoa.” It was good that the state cut back to five exams. Is this making a difference at the grassroots level? Are people reassessing accountability and seeing some of the positive aspects? There has been some momentum. During the 2013 legislative session, when lawmakers rolled back high school tests to five exams, there was a big move by parents to roll back middle and elementary school exams, too. But they didn’t succeed then or in the next session. They have lost some momentum to roll back testing. Testing may have needed some adjustments, but we may be finding equilibrium. We’ll see. Nationally, we’re in a different era with the Every Student Succeeds Act. As you know, it transfers more authority for accountability decisions back to the states. 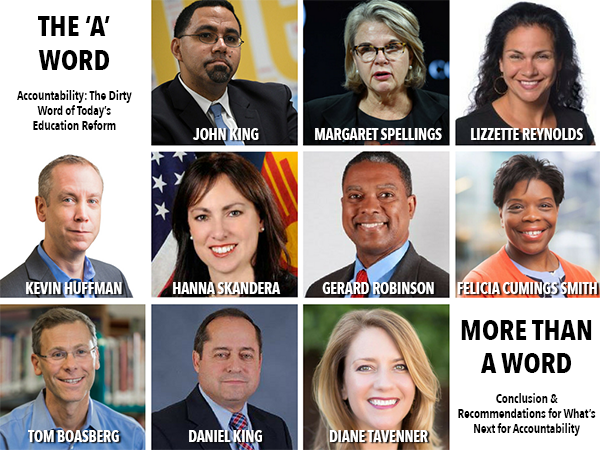 What should we expect of school board members, superintendents, and state leaders when it comes to ensuring all students have the opportunity to learn and succeed? The problem today at the national level is that everything gets politicized, so when the administration changed from Republican to Democratic in 2008, a lot of very conservative states didn’t want to be held to any kind of national standard. There’s still a lot of resistance to anything nationalized. Certainly the latest election shows a rebound to the state level. Our best bet in Texas is continuing to focus on getting it right and being an example of what can be done. Texas was at a very different place than most of the nation when accountability started gaining momentum in the 1990s. Texas had been moving towards and experimenting with accountability since the early to mid-’80s. Few states had an exit exam, for example, but Texas created one in 1987. You had to pass an exit exam to graduate. My perfect system would include state testing, which is a common way of measuring whether students have a good educational foundation. Since we’re scaling early college work, the perfect accountability system also would include knowing our students’ progress in college coursework. And it would look at how graduates are doing in post-secondary education, the percentage of students that complete a post-secondary degree. Then, districts could bring in the community as college partners and build plans to increase the percentage of students completing such a degree. Getting accountability right would mean finding the right balance and level of testing. Also, it would mean finding the right ways to provide assistance and interventions when a school or a district struggles over a period of time. Data is central to accountability systems. How do you use data in your work? We use data extensively. On my desktop I have a dashboard button that I can click and see what percentage and how many of my students have passed the college readiness exam. I don’t go this far, but I could look at how individual students are doing on state accountability metrics. I also could look at their attendance and classroom grades. I have a dashboard button on my computer where I can pull up data anytime and go as deep as I want in any issue we think is important in our district. How do you translate that orientation to the school level? How are you getting teachers to use it, for example? Some of this we do well, and some we need to get better at doing. A lot of this is working with teachers to see how information can help them, make life easier for them, and help them to be more successful in their jobs. How do you hire or develop educators with an entrepreneurial mindset for student success? What do you talk about with them or work on to develop that drive? It takes a good balance between being patient but yet expecting things. I call it a patient impatience. This is critical. We’re in a time where superintendents are brought in from the outside and seen as miracle workers. But most of them don’t last more than about three years. A lot of times they bring in a whole team with them from the outside, and they just get spit out. I came in here as an outsider, but I started working with the people inside and then gradually brought in a few people from outside as needed. Most districts have the people inside that can do the work. It is changing the mindsets. This requires working by example. A lot of work has to be done within when you’re trying to change a culture and create systemic change. Focusing on key areas and getting some early wins is important. That builds credibility. We made progress here quickly on the dropout rate, for example. We started celebrating successes, too, in our key areas. As people saw out-of-the-box solutions making a difference, like opening a dual-enrollment high school for dropouts and students between the ages of 18 and 26 who did not complete high school, they saw we valued solutions. Then, things started happening. What uncomfortable truth or truths have we been unwilling to address in education? For one, we’ve been unwilling to address the resources it takes to educate the very hardest-to-serve students. For example, some of our students need case management at our dropout recovery programs. Another uncomfortable truth is that, as a system, we’ve failed to fully deliver on the promise of some of the choice options, such as charter schools. When Texas started discussing charters in the 1990s, a lot of the idea was to take what we learned from charter schools and use it to improve schools in general. I don’t think we’ve kept that focus. We haven’t dug in and looked at what it would take to design a charter, or two or three top charters, to really turn around education in a struggling neighborhood in Dallas, San Antonio, or Houston. We should give the people with the best proposal a neighborhood and let them take responsibility for the entire neighborhood. The current system doesn’t allow us to dig in to know what it really takes to work with every student. What is at stake for us to get these issues right? What’s at stake for Pharr–San Juan–Alamo? Everything’s at stake for Pharr–San Juan–Alamo, the whole state of Texas, and our economy. If we don’t improve social mobility, we’re going to become more divided than we already seem to be.